Normally, it is difficult to apply computational models across different studies because the gene expression data is “noisy,” meaning that there are many factors that differ in the way gene expression is measured. To begin their analysis, Greene’s team added more noise to the data and then trained a computer to remove the noise. To remove the noise, the computer had to learn about key underlying features of breast cancer. “This approach of removing noise makes the models we constructed more generally applicable,” Greene said. 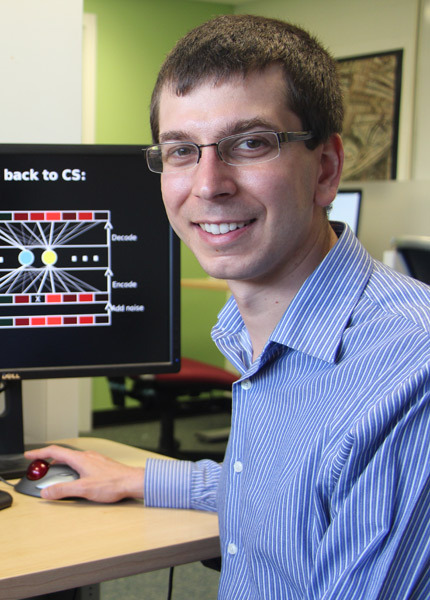 Greene and the Dartmouth team studied DAs, which train computers directly on the data without requiring researchers to provide known biological principles to the computer, as a method to identify and extract complex patterns from genomic data. The model that the computer constructs can then be compared to previous discoveries to understand where data supports those discoveries and where the data raises new questions. The performance of DAs was evaluated by applying them to a large collection of breast cancer gene expression data. Results show that DAs were able to recognize changes in gene expression that corresponded to the cancers’ molecular and clinical information. Next for Greene’s research team are more complex models that take multiple levels of regulation into account. Their goal is to develop methods that not only model data but that can automatically explain to researchers what the models have learned. Dr. Greene and his team of investigators do their research at Dartmouth’s Norris Cotton Cancer Center in Hanover and Lebanon, New Hampshire. Their work is supported in part by NIH funding P20 GM103534 and the American Cancer Society Grant #IRG-82-003-27.